Bordering – see what I did there? 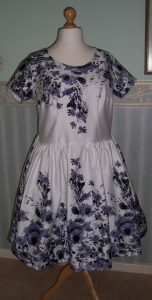 I am now working on the border print fabric for my dress to wear as a guest to the family wedding on July 2nd. Decisions, decisions. The problematic (in a good way) thing about making your own clothes is all the decisions that have to be made…. which bodice style shall I use, which style of sleeve, neckline, skirt? Having settled a few style decisions in respect of bodice, neckline, sleeves and skirt I still had to decide on placement of the border print. Should I make the entire bodice in the plain central part of the fabric design? Should I have the border around the shoulders of the bodice pointing down towards the waist? Or, should I have the border placed on the waistline, pointing up towards the shoulders? The design on this border is asymmetric – should I place longer parts of the design central to the bodice or equidistant from the centre front? 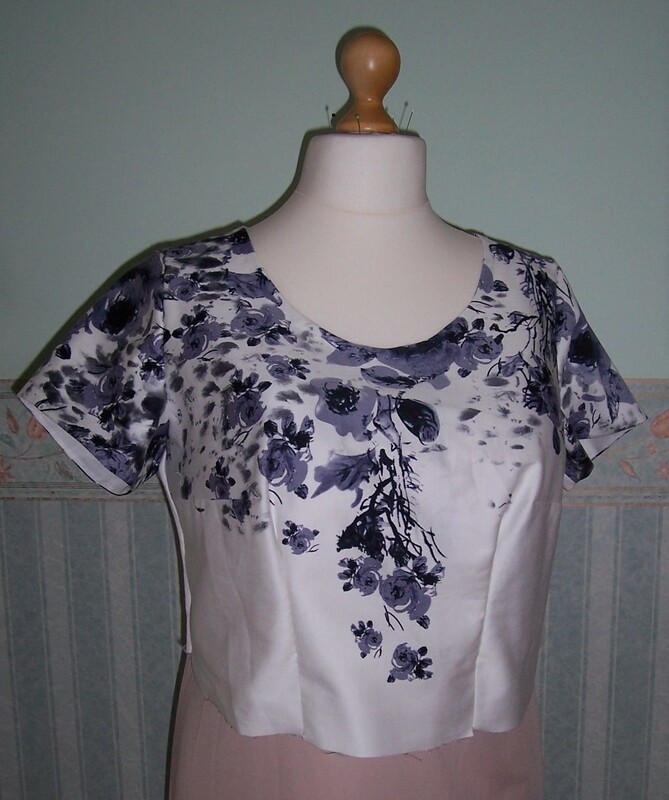 To begin with I cut and stitched darts in the front bodice with the border around the shoulders with the longer design lines descending equidistant from the centre front. Definitely not the best decision. 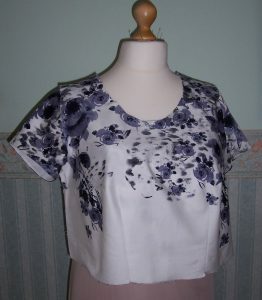 I re-cut the front bodice with the main motif centrally placed – so much better. I also took this opportunity to ‘finesse’ the body darts so that the midriff section is more fitted to my contours. Now the decision had been made for me with regards to the border placement on the skirt. It would be placed at the hem with the design ascending towards the waist. 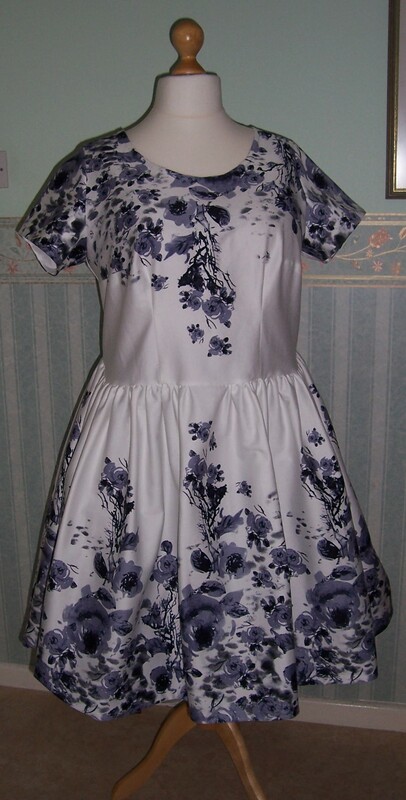 I would place the main motif in the centre front to co-ordinate with the bodice design placement. This means that the waistline area is in the plain White part of the design – maybe a good idea to make a coordinating belt….. let’s see how I get on. Although I initially decided to make the skirt with gathers, when it came to it I thought it would look better with soft unpressed pleats. I pinned, tacked and machine-basted the pleated skirt to the bodice – hmmm- not sure. I unpicked the pleats and replaced with gathers. Tacked in place it looks so much better, especially when I tried it on with a full can-can petticoat underneath – it really showcases the lovely border design. Having machine stitched the skirt to the bodice, I finished the seam with the overlocker and moved on to inserting the zip into the centre back seam. I had made a point of leaving a 1 inch seam allowance on the back bodice and skirt to give me plenty of room for a lapped zip insertion. I completed the sewing of the skirt seam and basted the zip opening with a stitch length of 5. I used a plain White zip from my stash of continuous zips and cut a length of 20 inches. The right hand side of the zip was machined in place and the left hand side machine basted. I then hand picked the lapped side of the zip for a really neat and professional finish. Around the neckline I also hand picked approximately 3/8 ths inch from the edge. Finally, the hem. Taking inspiration from Sian of Kittenish Behaviour, I used a ½ inch wide White satin ribbon. This was machined close to the overlocked edge of the skirt and then turned to the inside and hand-stitched in place. Using the ribbon has given a little stability and structure to the hem line without losing more than ¼ inch in length. A good press and now the dress is ready. I am still thinking about a co-ordinating belt to cover some of the expanse of plain White around the waist but meantime I shall get on with making the Black linen-look Bolero jacket…….. sewing, sewing, sewing!